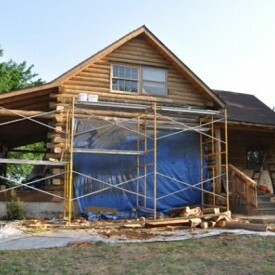 Log home restoration and refinishing is what we do the best in the Chillicothe area. You can also compare us to other companies when it comes to log home repair, chinking and caulking your log home, log home improvement, and maintaining your log home. We have professional staff and experienced crews to ensure your log home work is done right. If you call us today, you will be that much closer to an explanation and an estimate of the best solution for your log home. You can also request an estimate from our website to speak with an estimator. We want to help you with your log home care! 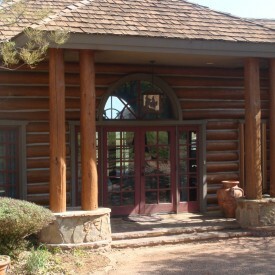 When you call 888-LOG-GUYS, you will find that we have a process that will make your log home even better than new! Once we are done media blasting the old stain off the logs, we will sand the logs smooth at your request before we clean the logs with a borate treatment. Once that is done, we will apply chinking also at your request before brushing on the perfect stain to protect your log home. For a consultation on what process will be best for your log home, contact us by phone or request an estimate online. Before you try to fix your log home, let 888-LOG-GUYS take a look at it to see how it should be properly repaired. And then ask us to do the repair work for you! 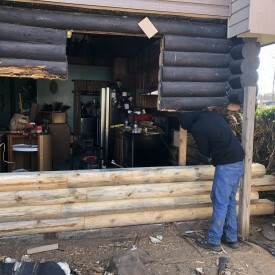 Our crews have thousands of feet of log repair under their tool belts, and they will know how to repair or replace your logs on your log home. Whether it is due to log rot, severe weather, water damage, bug or insect damage, or bird damage, we can solve your log home problem and bring back the integrity of your log home. Chinking and caulking should be properly applied to close gaps in between logs and prevent annoyances like water leaks, air drafts, and unwanted bugs and insects coming through your log walls. Make sure you call 888-LOG-GUYS for a consultation on how we can chink and caulk your log home. Don’t delay! And don’t allow subpar work that will cause serious log problems later down the road! Let our crews get it right for you the first time! 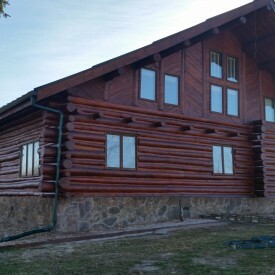 If you have a few ideas on how you would like to improve your log home, then call 888-LOG-GUYS for assistance on building and constructing additions to your log home. We can create log staircases! We can build log railings! 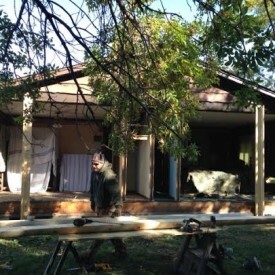 We can construct decks, patios, and porches! Just ask us, and we will tell you what we can make for your log home! We want your log home to be just like the one you have dreamed of! 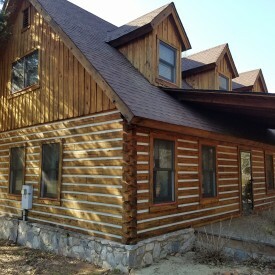 We are the best log home maintenance company in the Chillicothe area! We know what is involved in the upkeep of a log home. We know how to preserve and protect logs so that they last for years to come. Each log home needs care and attention to ensure the quality of each log, and we will keep track of when your log home is due for maintenance. Call us to speak with an estimator, or you can request information from our website. We are just a call or a click away!